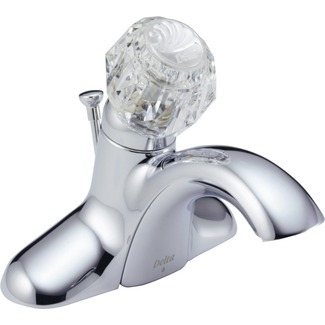 It was a basic faucet that you can buy at a hardware store for about $26. I went to look for a new one and I was really disappointed to find that faucets are crazy expensive. There was one just like the one I had for $26 and the next one in price was $60… talk about a price gap. Well thankfully my Dad came to the rescue. He had one from Sam’s Club that he bought and didn’t use because it was the wrong size. Thankfully, it was the right size for mine. My Dad and I got the faucet put it in but we didn’t have the right tools to do the drain so I had a plumber come out and fix it all up. I love it! It makes my bathroom feel so much more finished. You may notice that there are all kinds of metal in there now… the sink is brushed steel, the mirror is like an aged metal, and the towel ring and outlet covers are oil rubbed bronze. I like it all and I don’t mind the mismatchyness of it. Since this bathroom is being curated over time and with little money I’m taking what I can find at a good price (the medicine cabinet is from craigslist, the outlet covers and towel ring are from Amazon, and the sink is from Sam’s Club). I’m just happy to check something off of my very long to-do list!